Audio Visual Services at 818.354.6170. The journey to Mars has been a challenging adventure for the 2001 Mars Odyssey team. The project began five years ago with plans for an orbiter and a lander to be launched from the west coast. 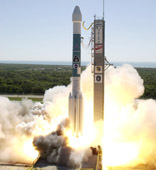 Two failed Mars missions in 1999 triggered a restructuring of NASA�s Mars Exploration Program, and the Odyssey mission was changed to an orbiter only launching from the east coast. This talk focuses on how the Mars Exploration Program learned from its failures, and how the Odyssey team ultimately overcame the difficulties in delivering their spacecraft on time and on target into orbit around Mars. 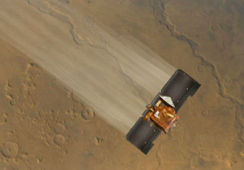 The presentation will describe how Odyssey is unveiling mysteries of Mars� mineral and elemental composition, and how Odyssey fits into the broader Mars Exploration Program objective to �follow the water,� seeking to determine if life ever arose on Mars.